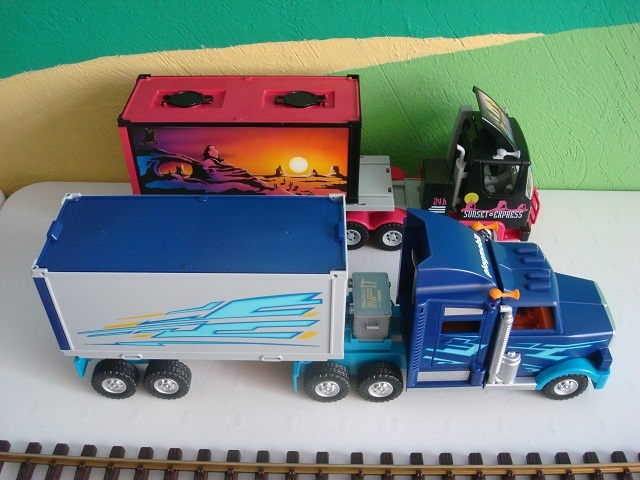 Just to close this photo-review for now, I add the set 4323, truck and semi-trailer. 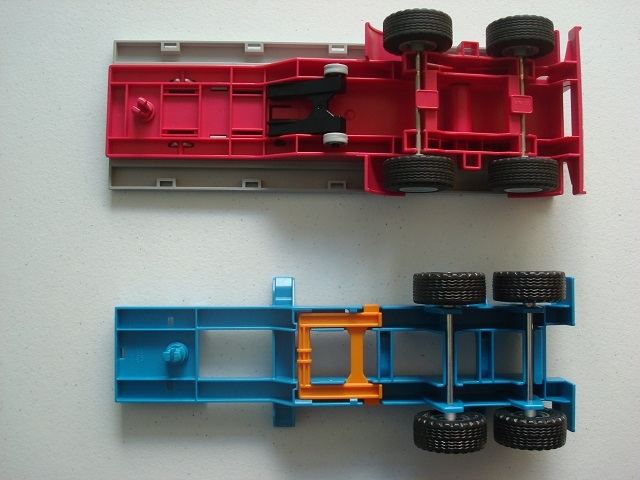 Actually, same modern molds used in the very first set showed in this thread (6437) but using different colors. 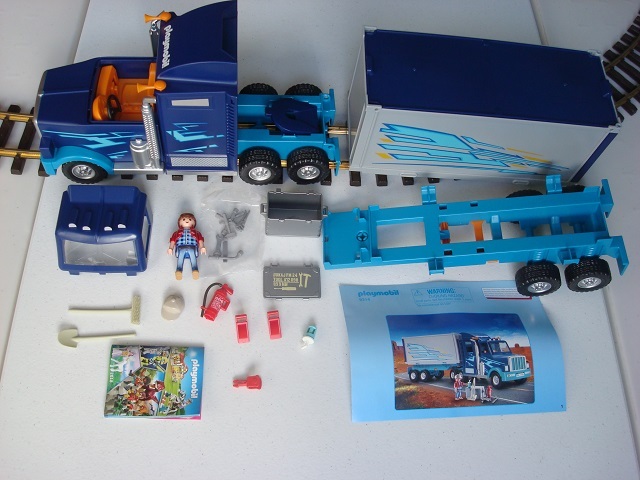 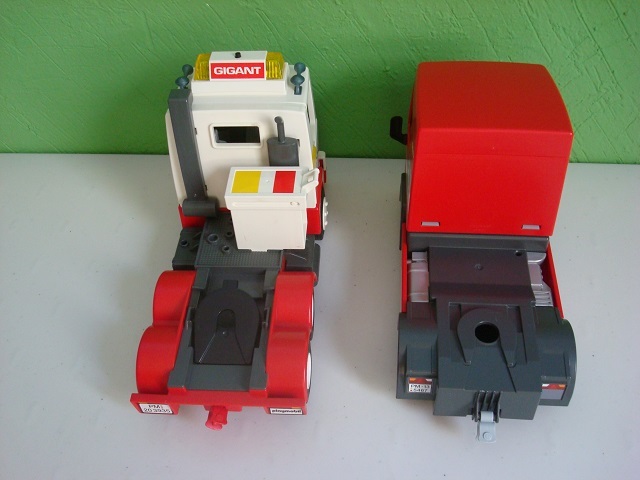 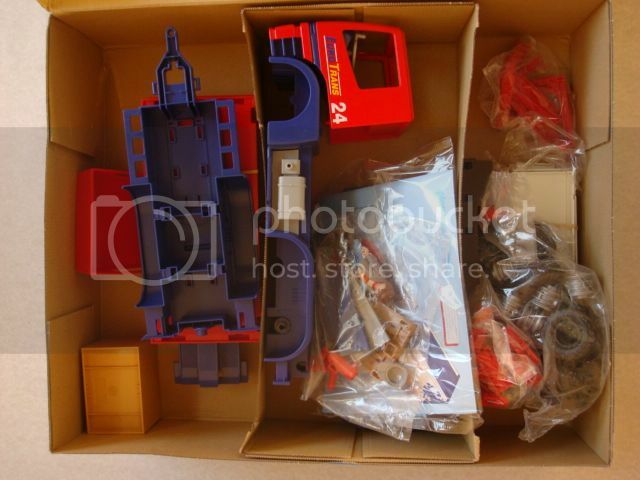 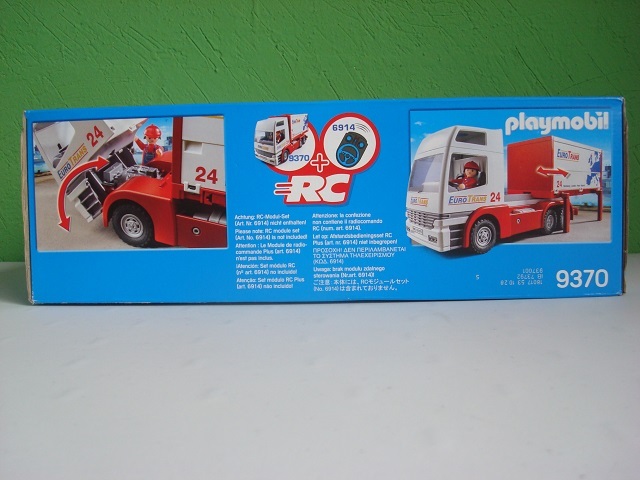 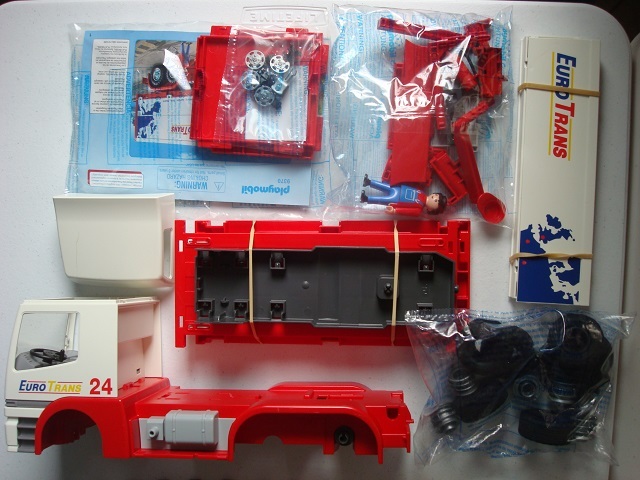 Set 4323 was released in 2007 and it is compatible with RC. 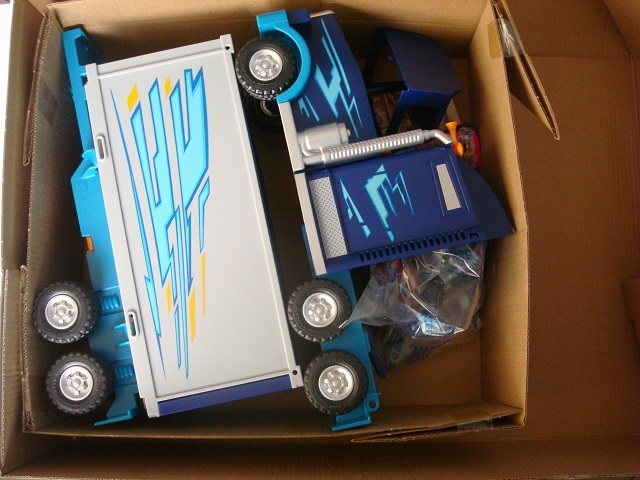 It includes two containers, few accessories and spare stickers for the big box. 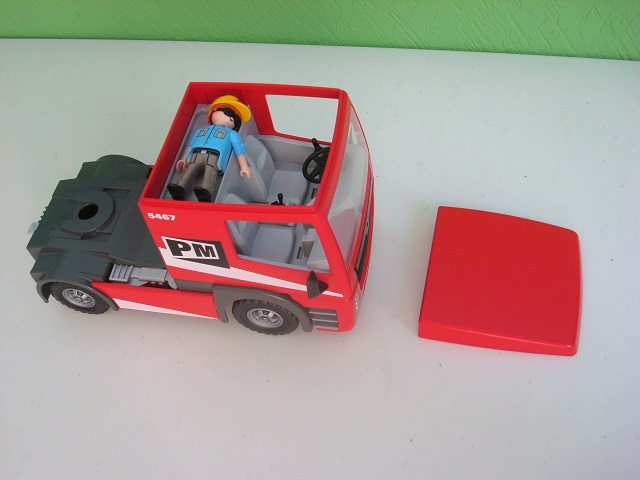 A nice detail is the driver bed at the top of the cabin. 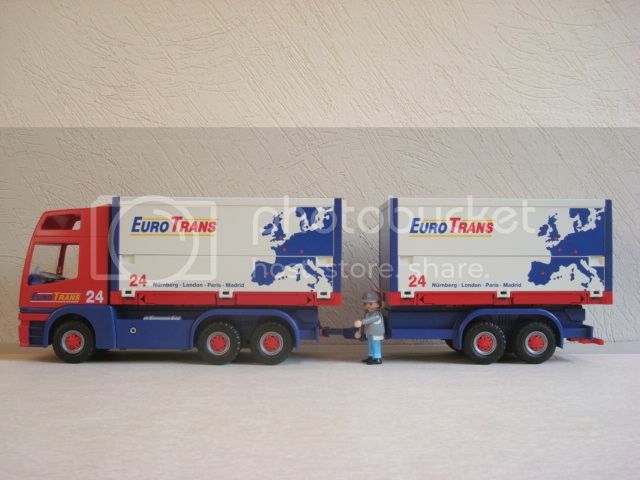 Comparative photos, including the size of other big guys. 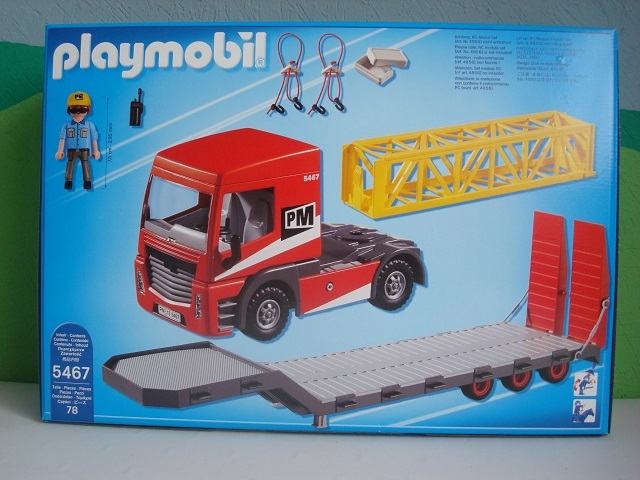 I will update this thread with few additional sets. 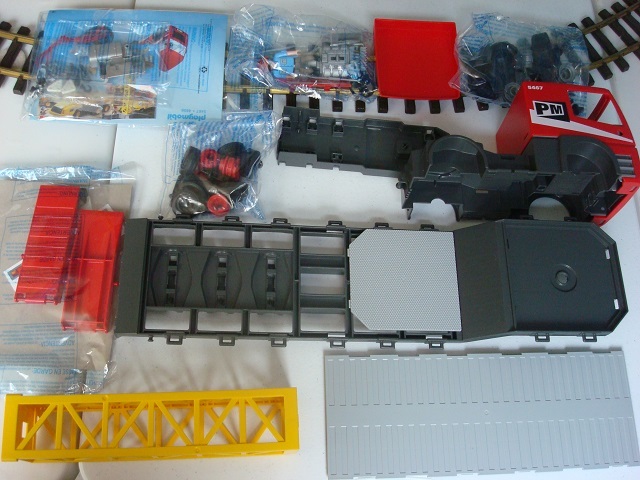 First one, 9314 Big Rig, released in 2018. 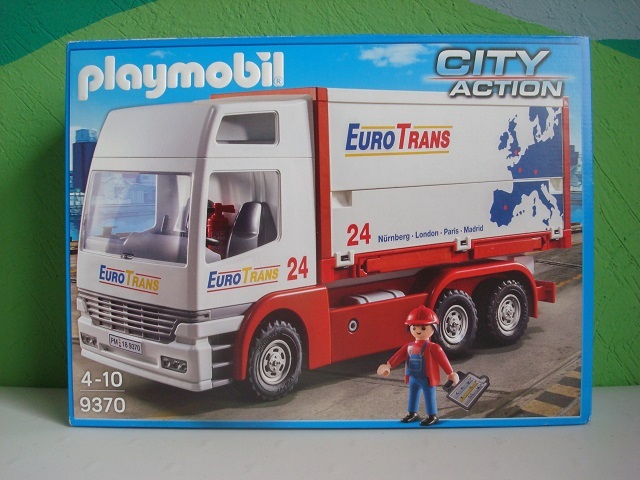 I always dreamed of a North American style tractor unit with engine and hood in front of the cab (as seen before, previous units were flat nose cab over engine or European style). 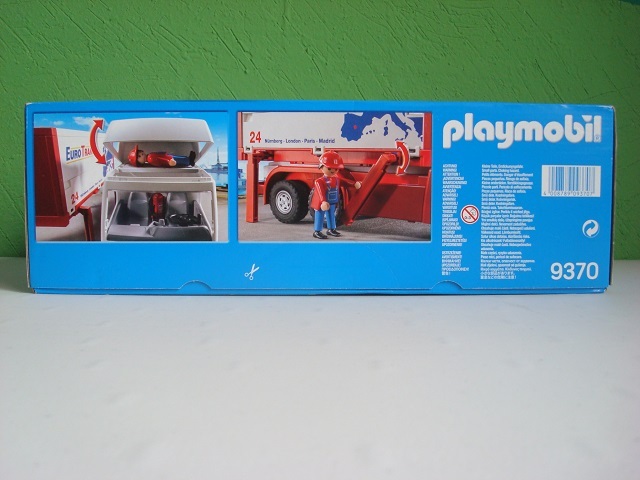 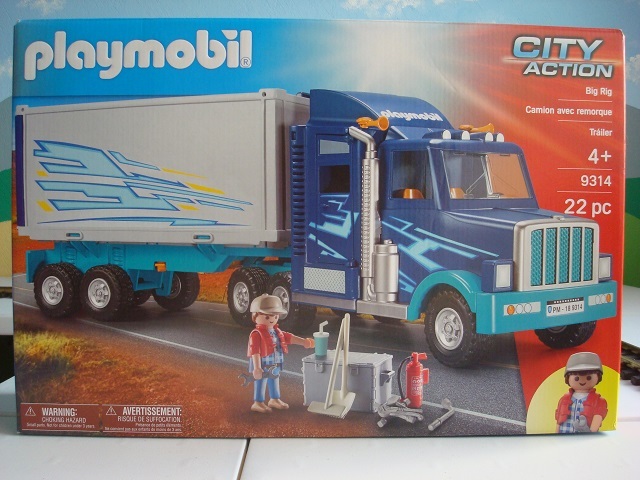 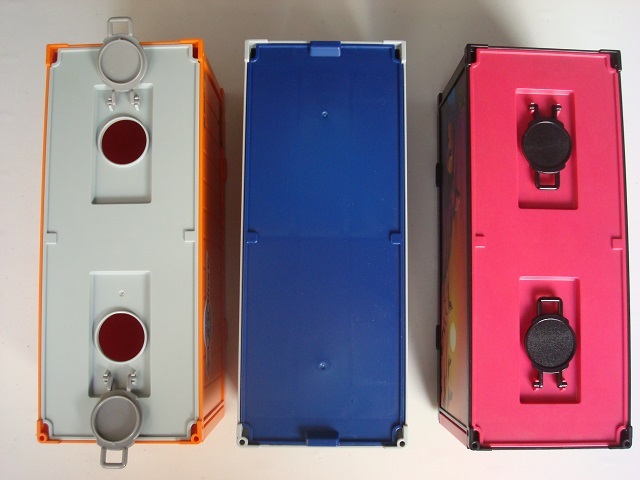 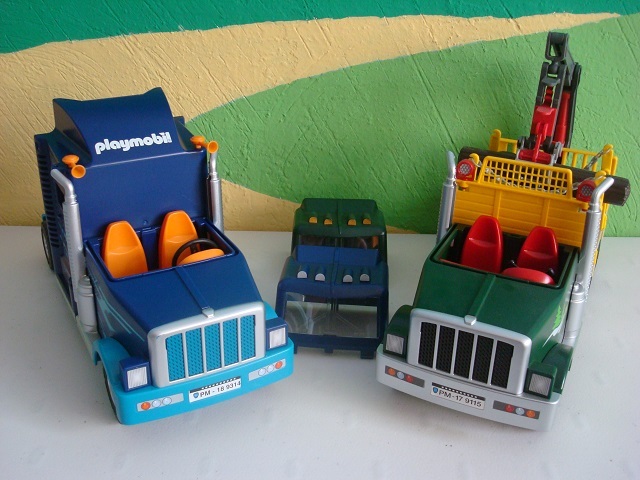 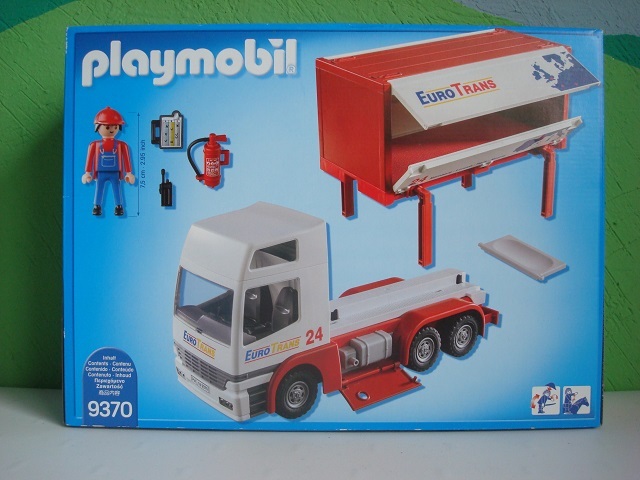 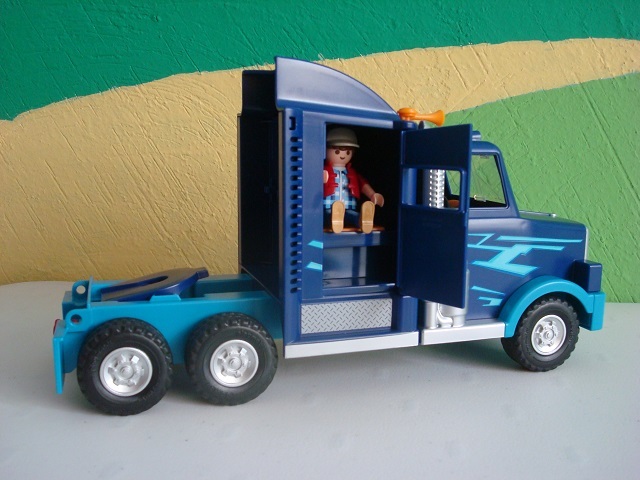 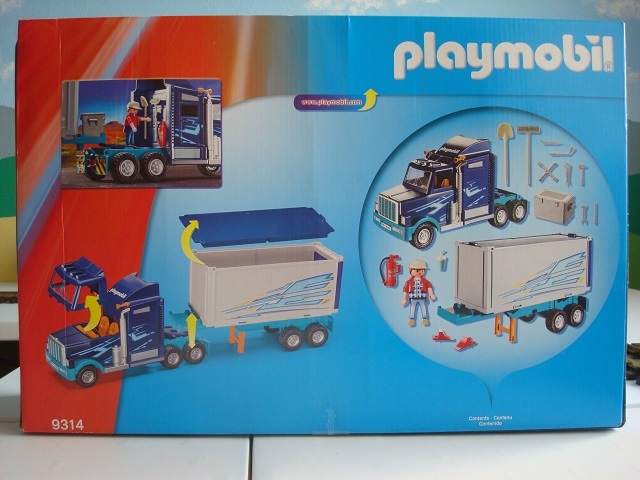 Playmobil used the same cab and chassis of Chinese truck series adding the sleeper compartment. 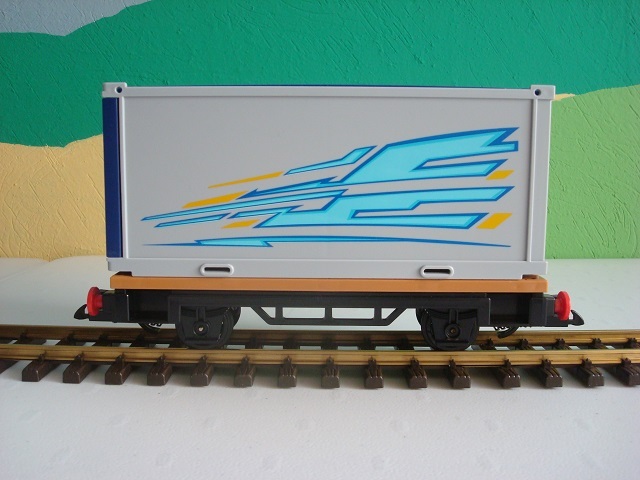 The final product is cool and looks modern although it has some cons: main one, quality is typical of Chinese series and some small details like there is no access to the sleeper compartment from the cab, only from outdoor. 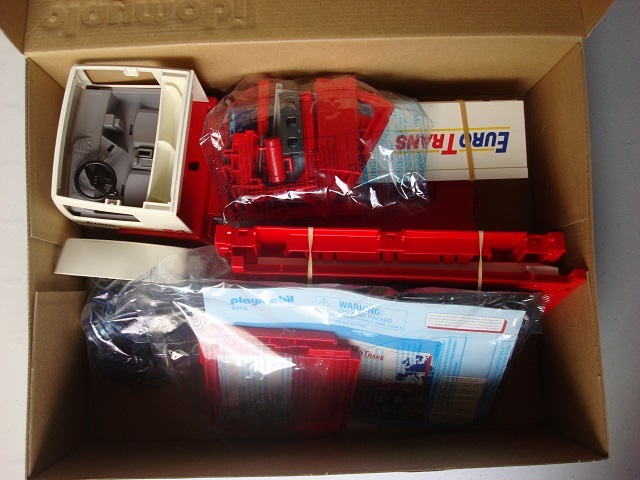 Also, everything is pre-assembled and packed inside a second small box besides the main one. 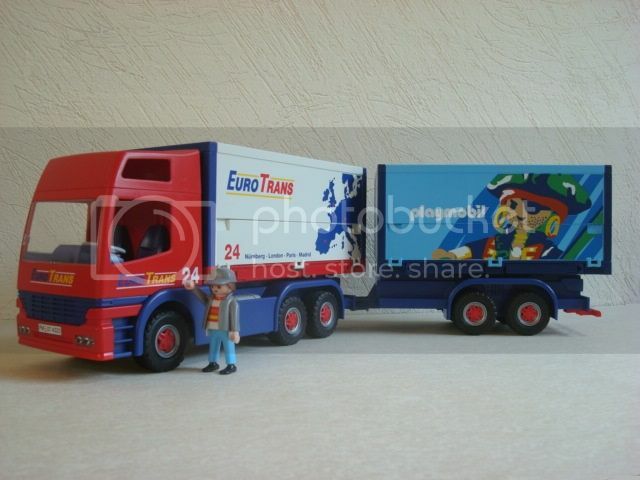 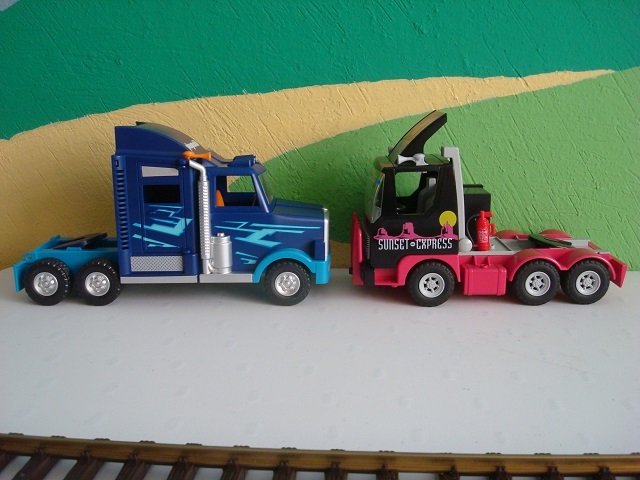 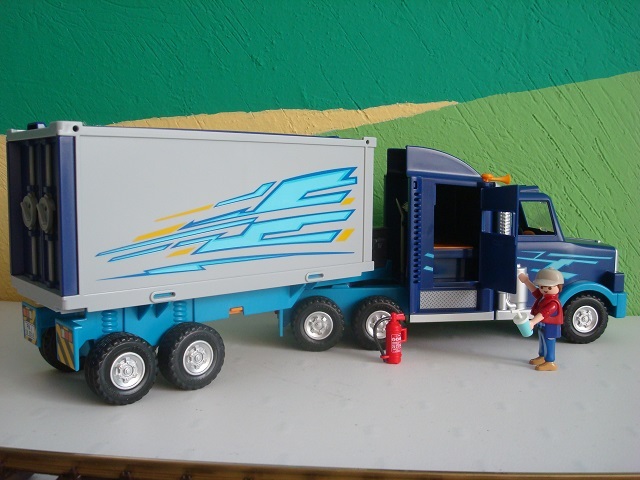 Final comparison with the European style truck. 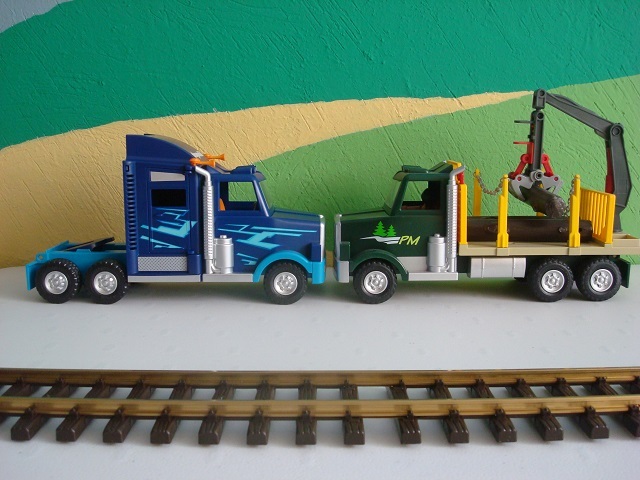 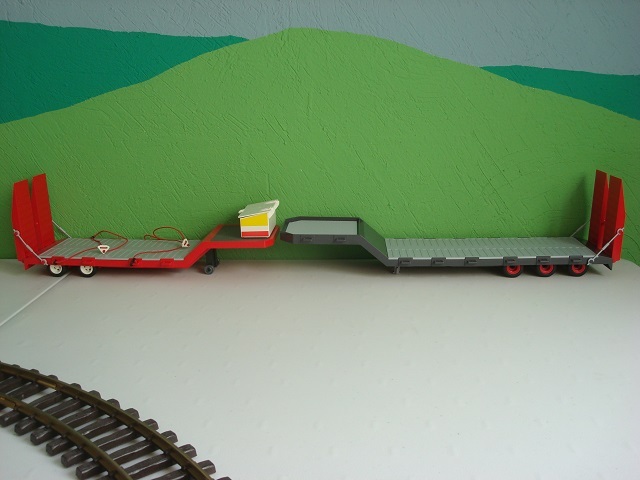 Trailers and containers are compatible, even with train flat wagons. 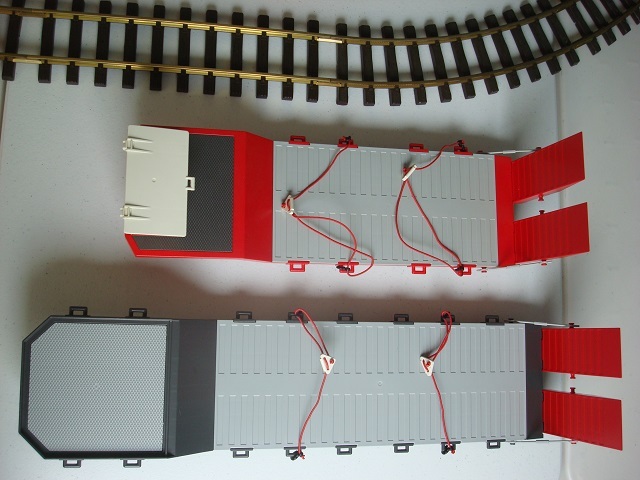 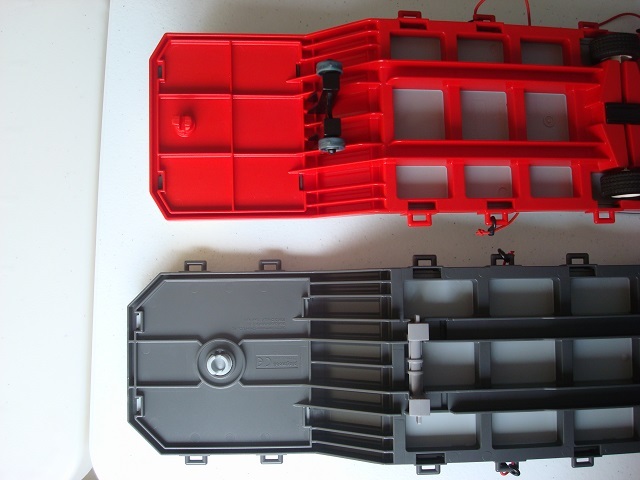 The new container roof does not have hatches and the side panels are not ridged. 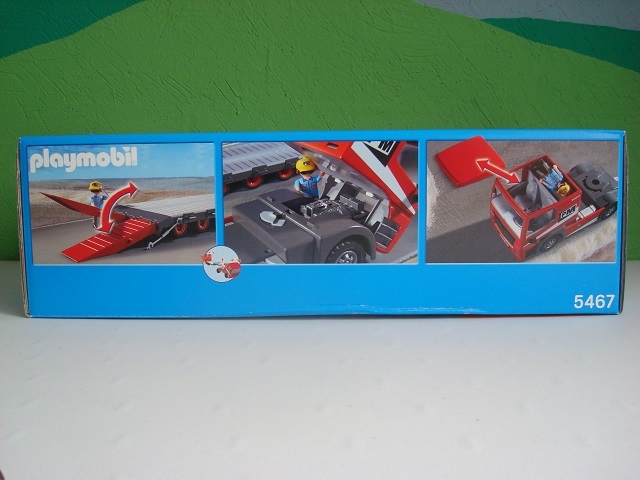 Hope to see new sets with more color schemes in the future. 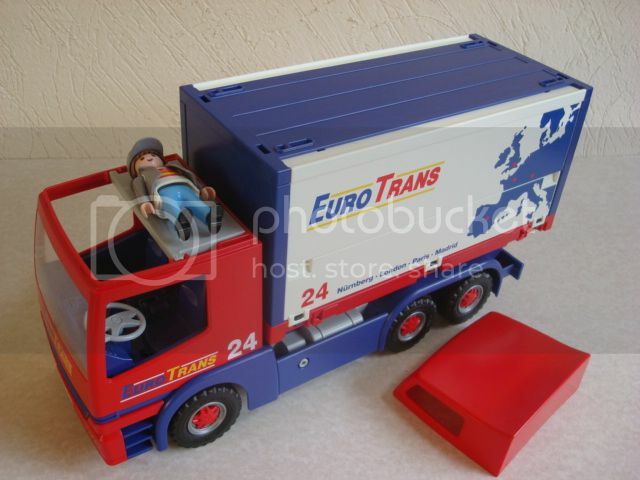 Thank you for the detailed review.. 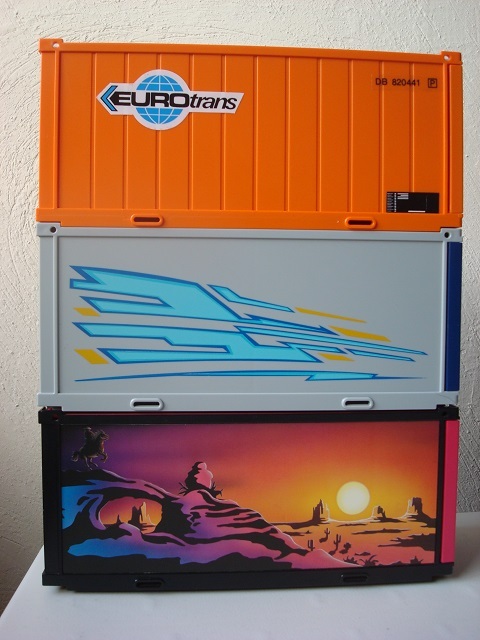 I really want that truck.. and now I would love an extra container too - seems much better for stickers, and I do love the color. 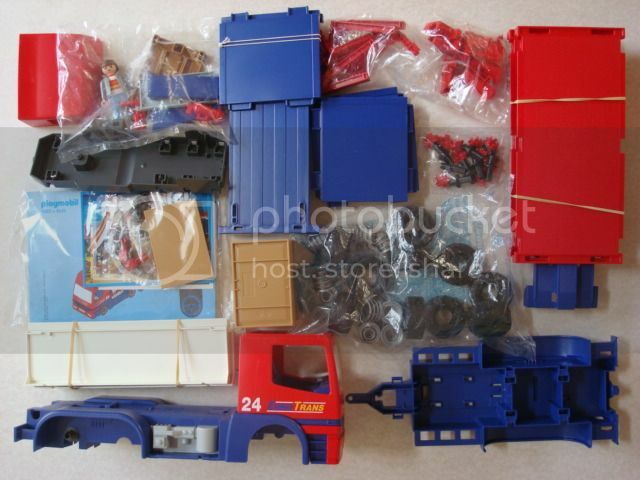 Still hope it makes its way to this side of the pond... 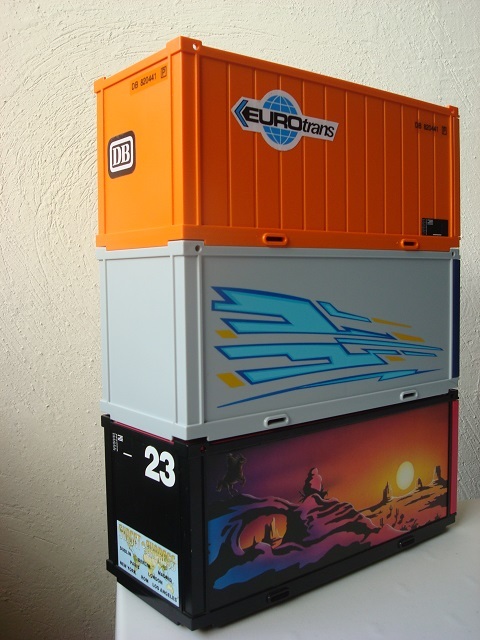 I don't want to deal with those... people... from customs. 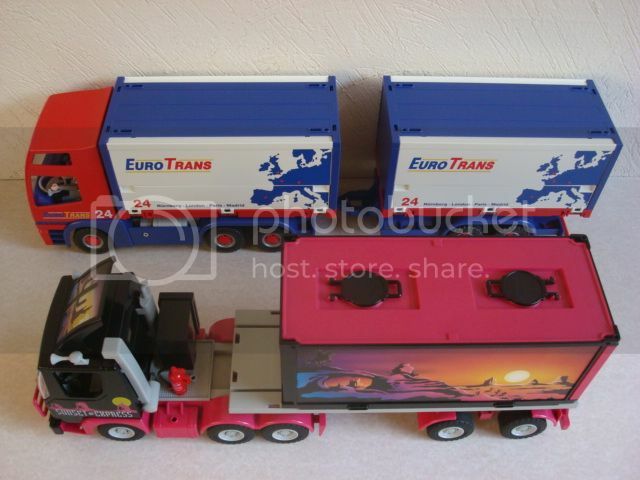 I wonder if anyone interested in trucks, has 9370 - Lastwagen? 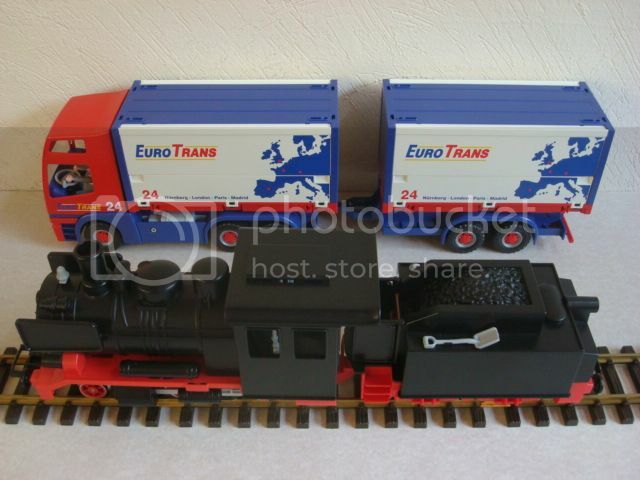 It was available on the FR site for a while (hence the spare parts listed) but the plans never were published. 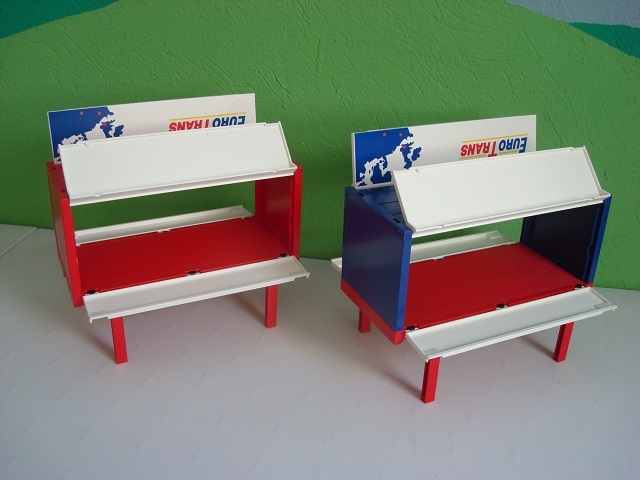 Plans received and inventory finished! 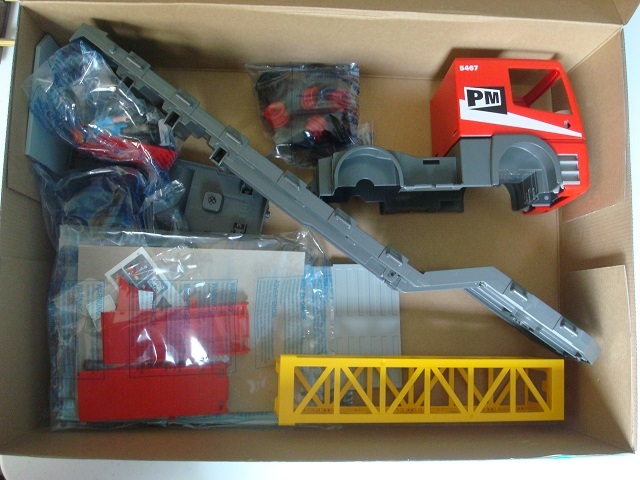 Thanks VicKlicktor. 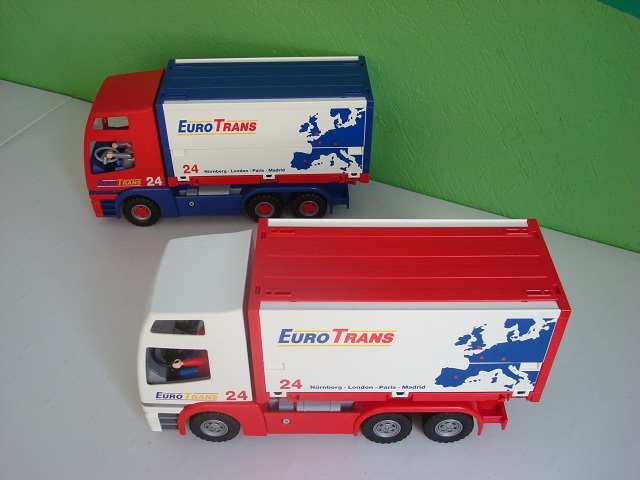 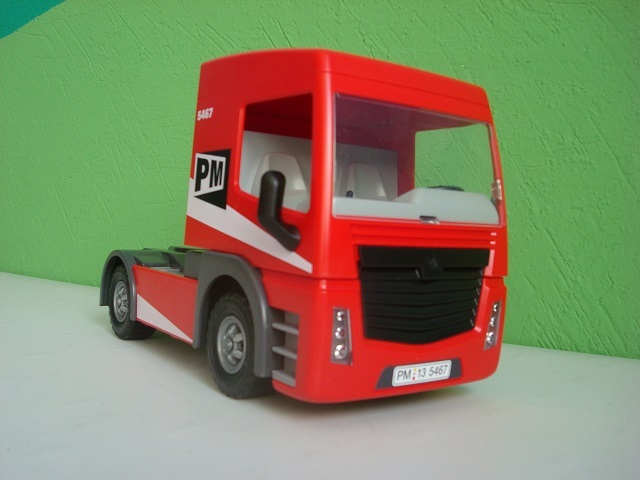 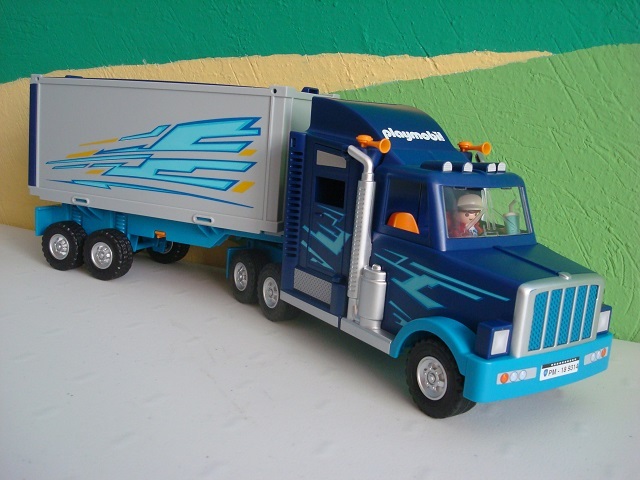 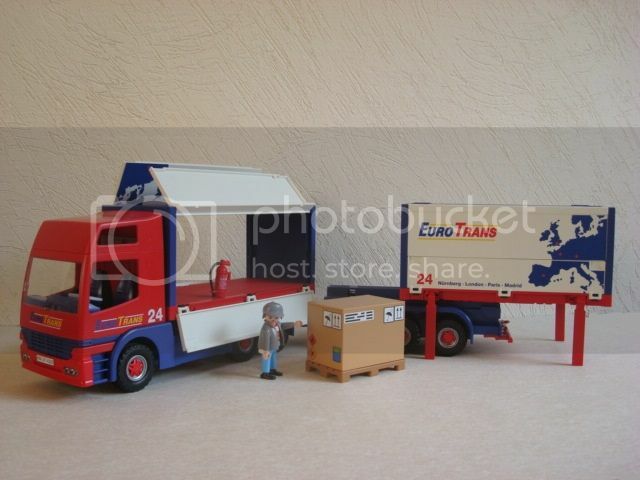 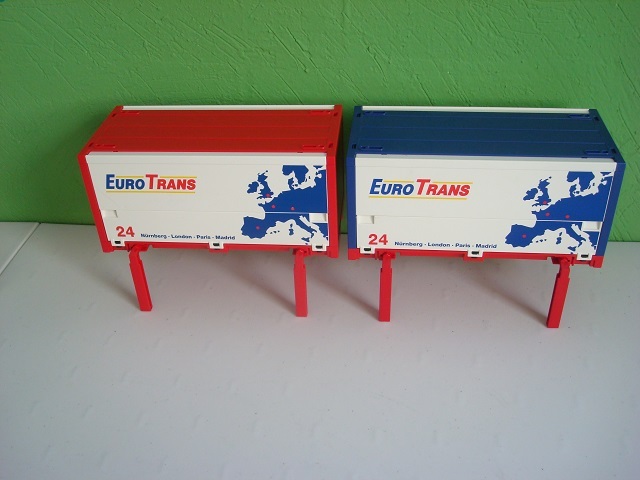 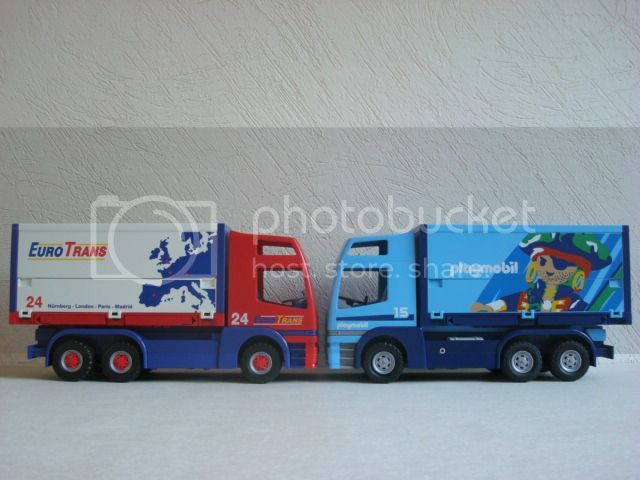 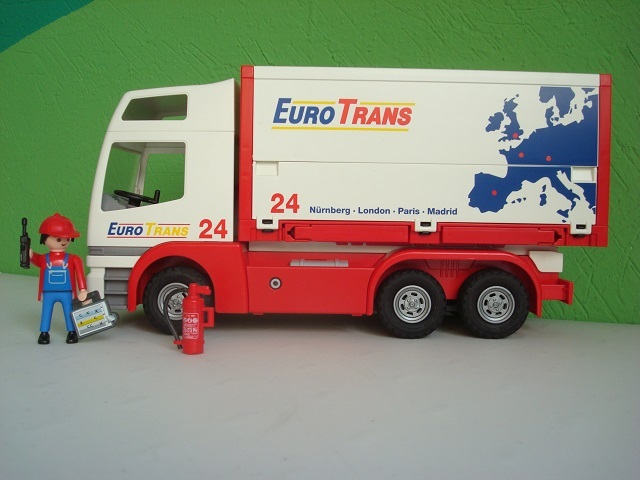 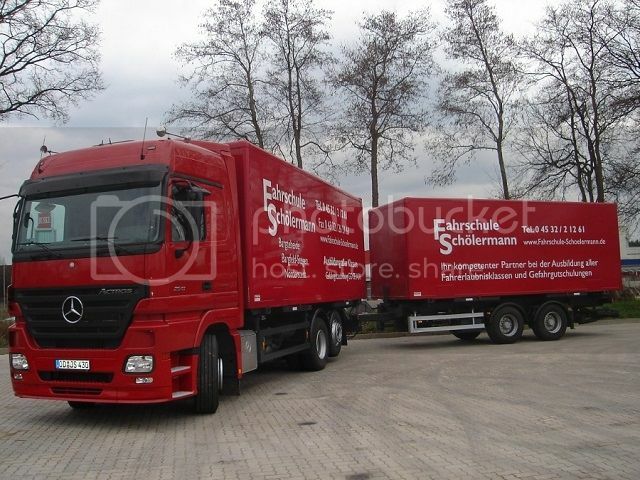 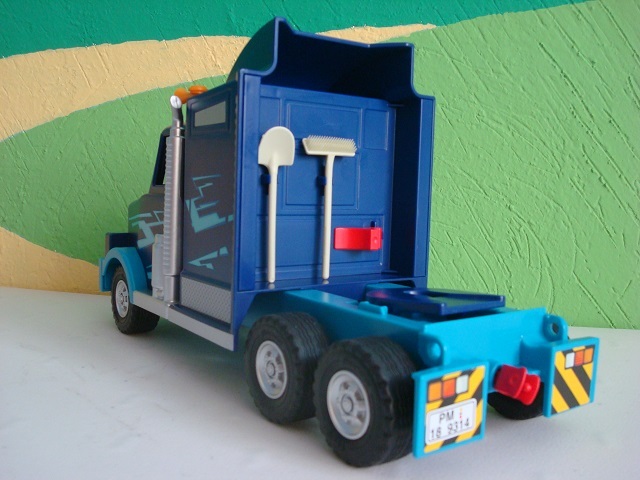 A new version for the EuroTrans truck 4323 of 2007 was released in the second half of 2017 with an alternate color combination and without trailer. 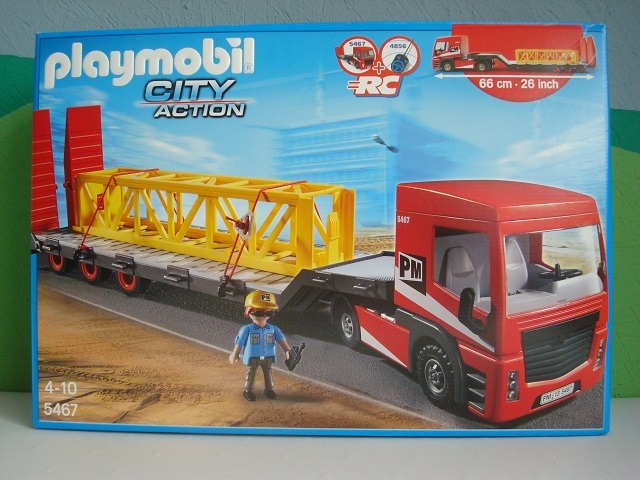 To date, this set 9370 is still on exclusive sale in the German hypermarket chain Real (although it was also available in the French PM site for a while). 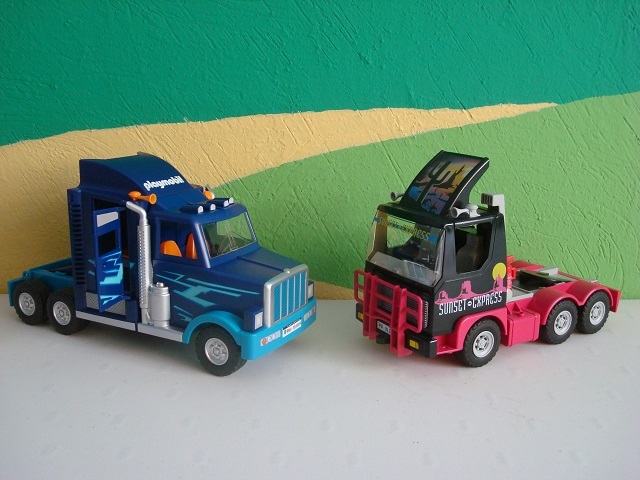 The features of both trucks are essentially the same. 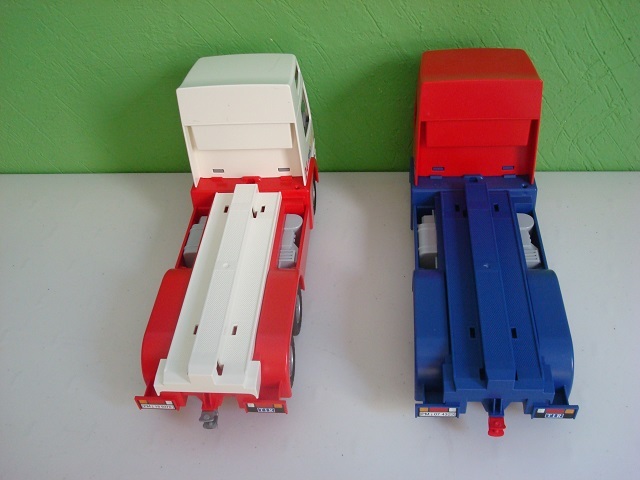 Comparison: The brothers together. 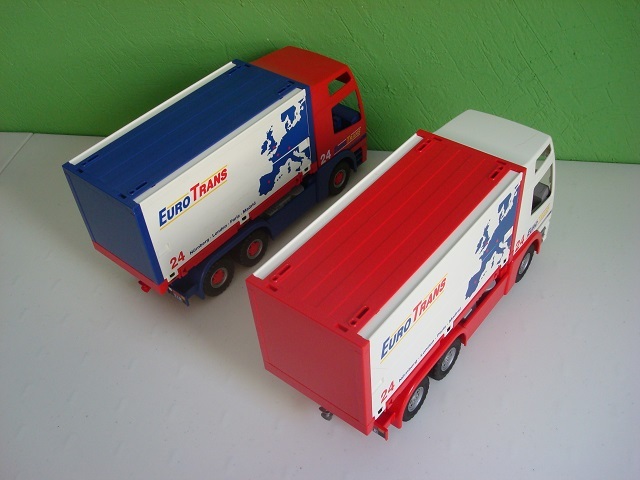 The elder one with red cabin and container roof in blue. 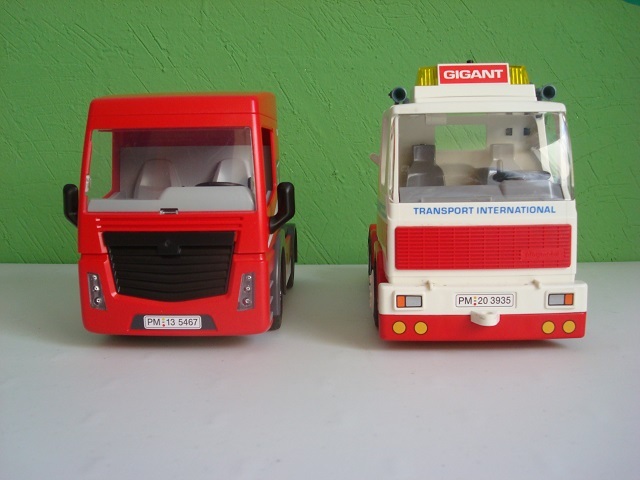 The youngest with white cabin and red container roof. 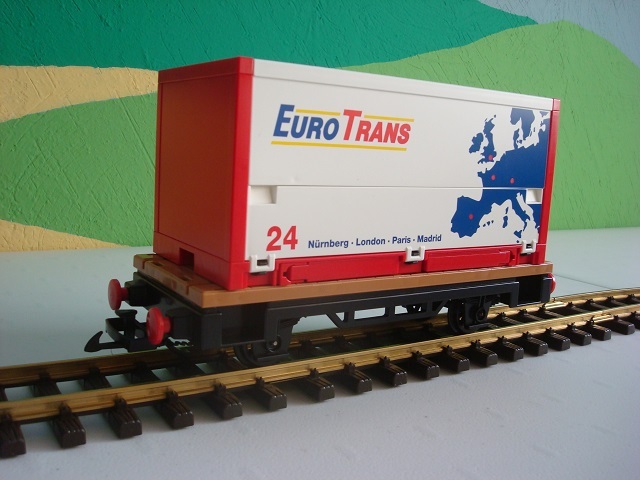 Containers are compatible with train flat wagons of course. 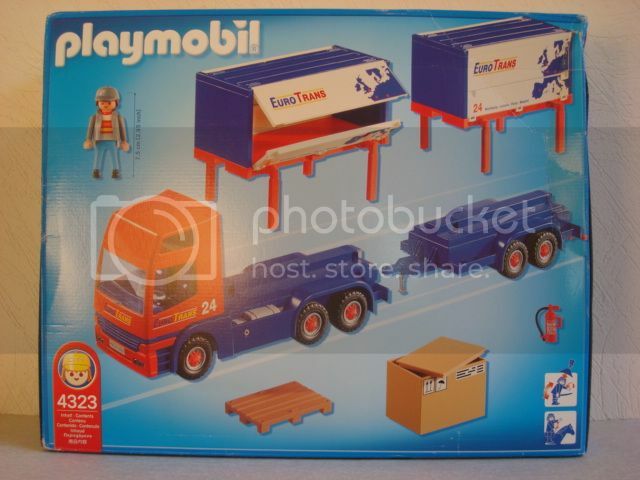 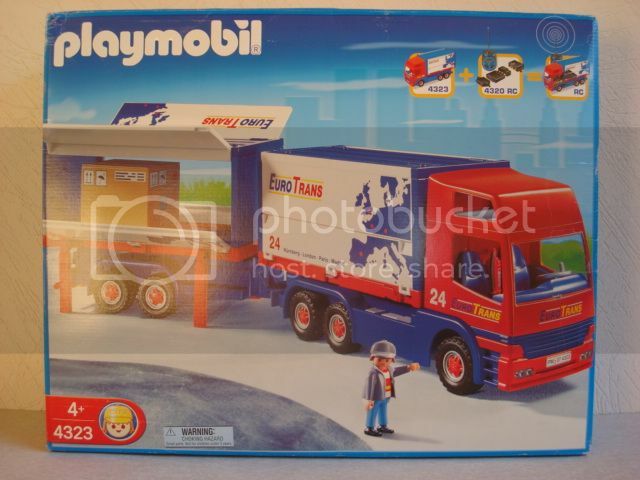 In 2013, as the set 5467 main element, Playmobil introduced an all-new tractor unit compatible with RC module. 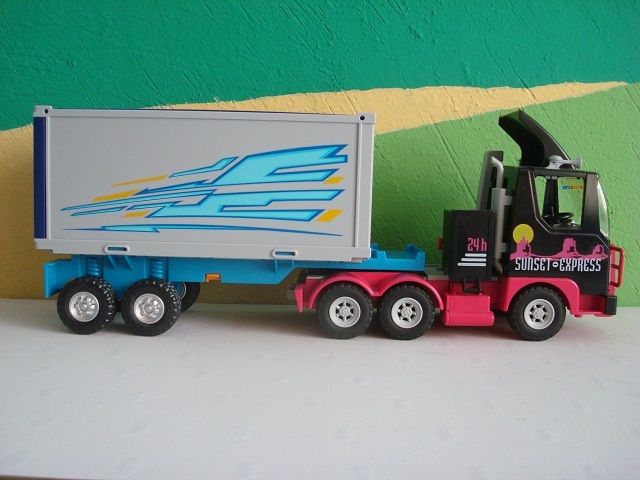 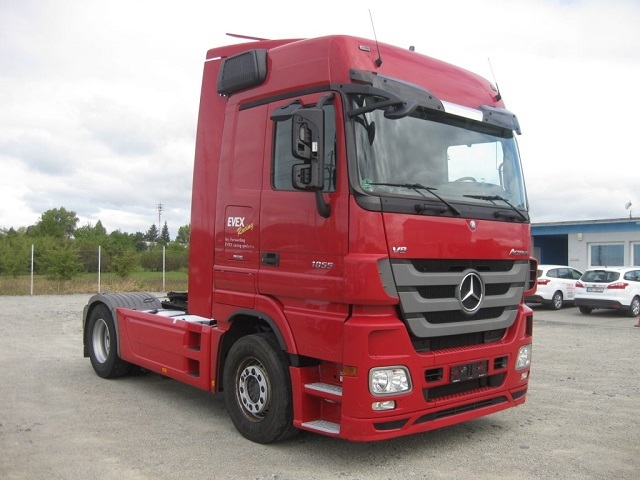 Simple but elegant, it resembles the two axle Mercedes Actros. 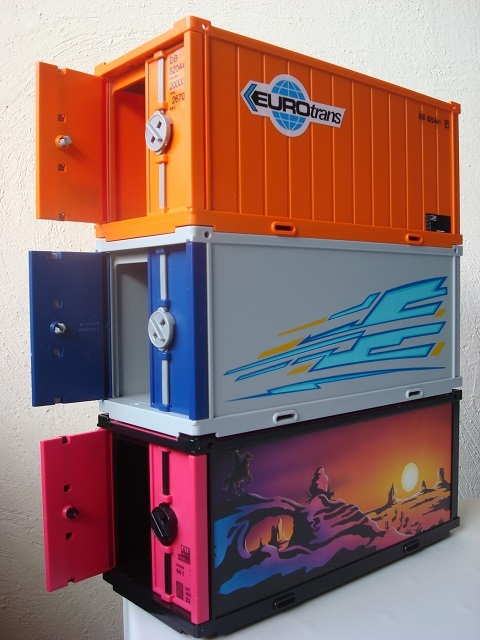 A small sleeper compartment is integrated to the cabin. 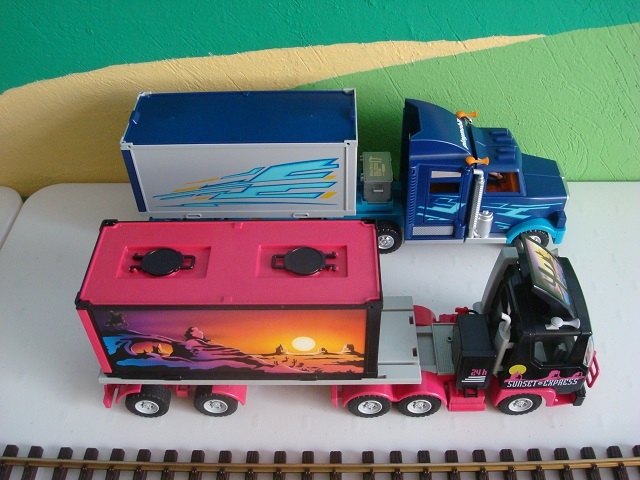 Besides semi-trailer and load, this set just includes one clicky, radio unit and facial tissue box. 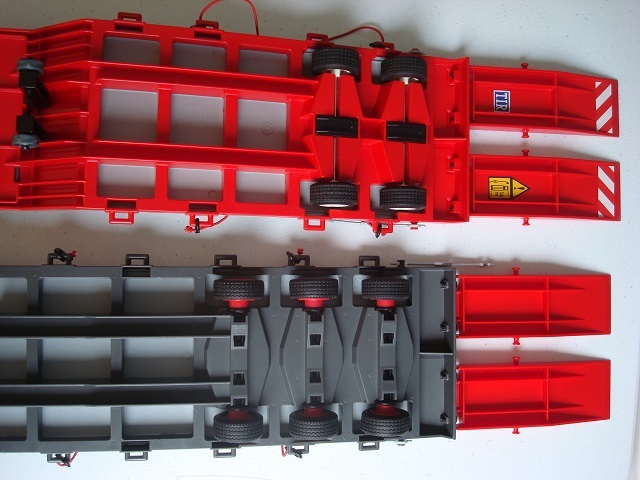 No tools, signal lights, fire extinguisher, wheel chocks, caution stickers for rear ramps, additional compartments or any other accessory. 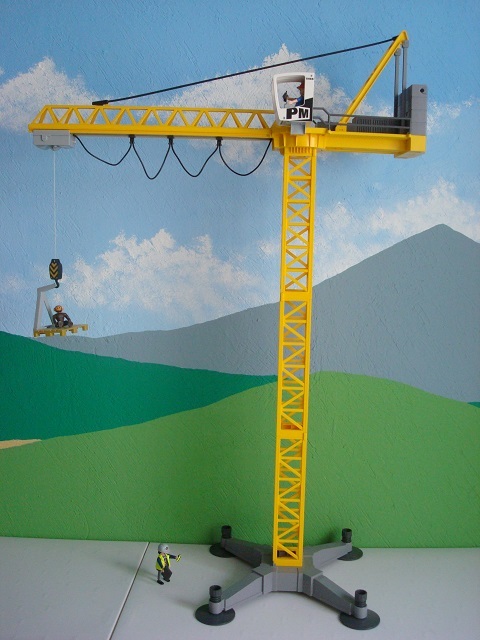 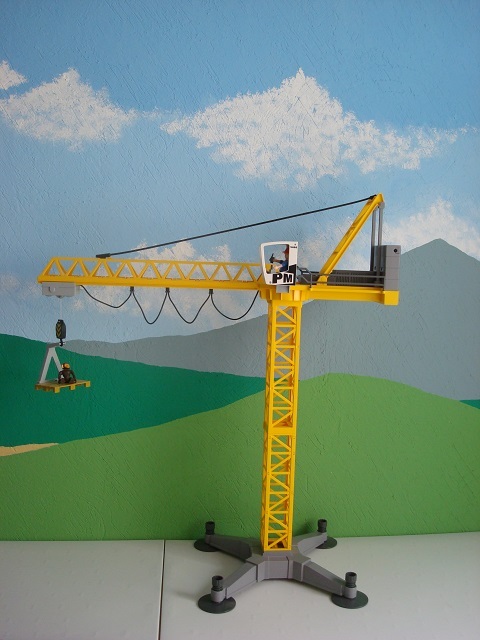 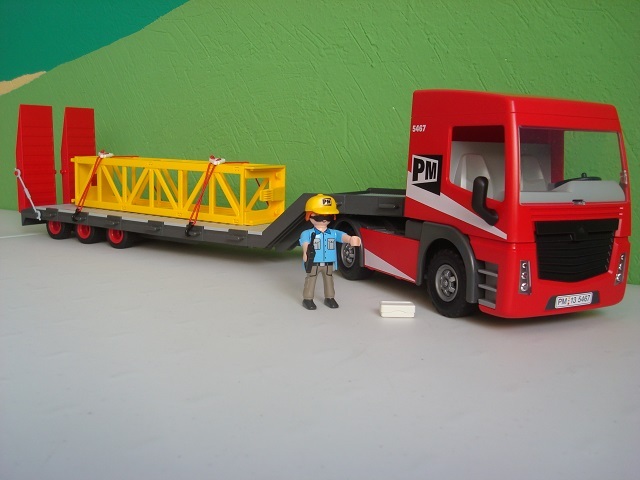 It is a plus that the truss section can be use to extend tower crane in set 5466. 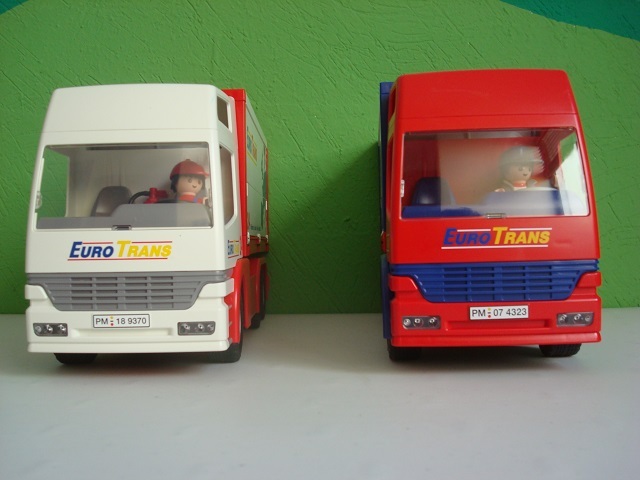 Comparison: Shorter than the three axle classical version, the cabin first time ever does have side mirrors! 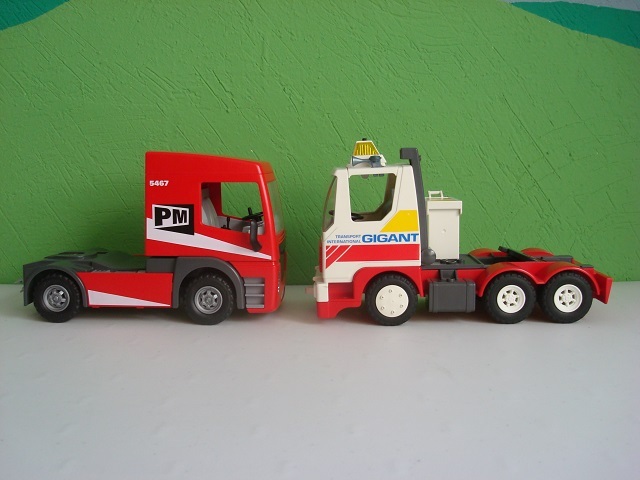 Silly omission before since Geobra never included them in previous versions of heavy duty trucks. 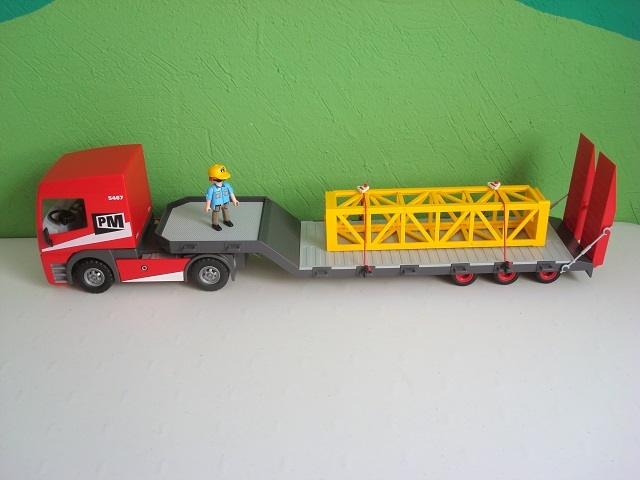 The lowboy (low load semi-trailer) has three axles and it is longer that its predecessor. 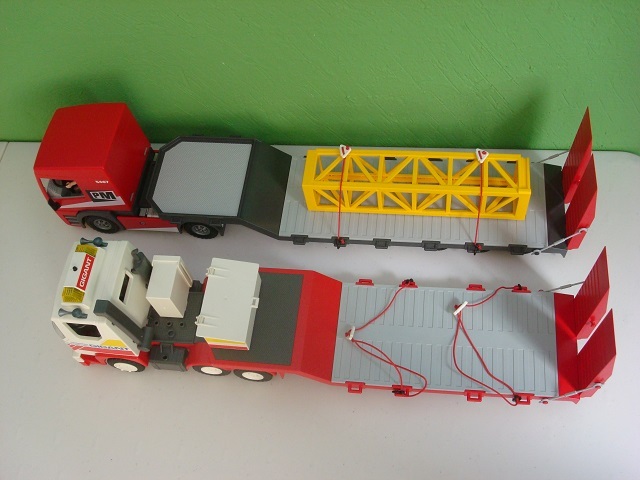 It comes with two short elastic strings to hold the load. 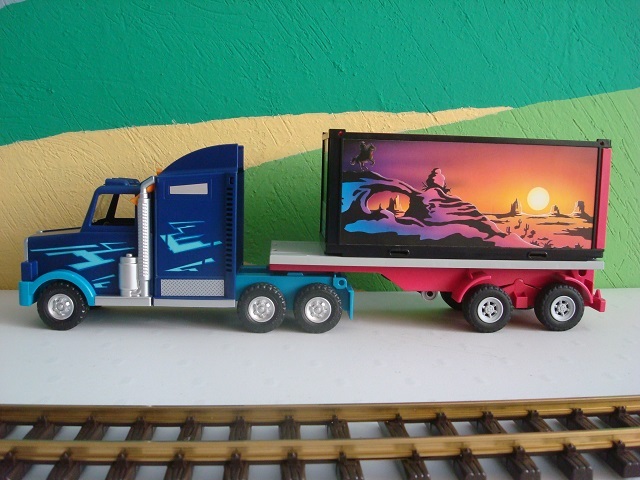 It's a pity that Geobra did not make semi-trailers compatible. 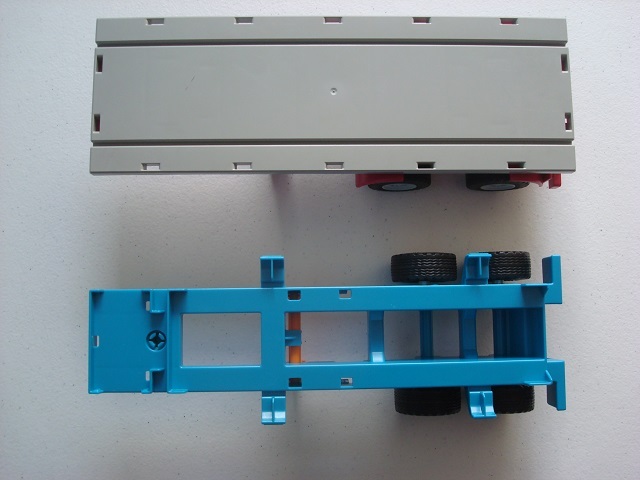 The new version has the fifth-wheel (turntable) integrated to the chassis and it is fixed. 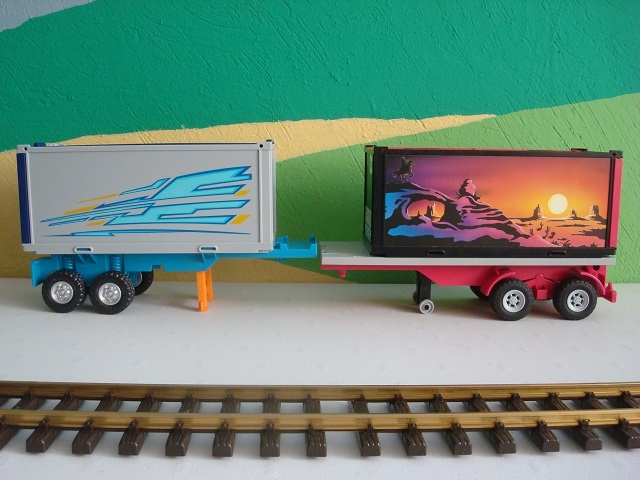 Also, the new trailer kingpin is wider. 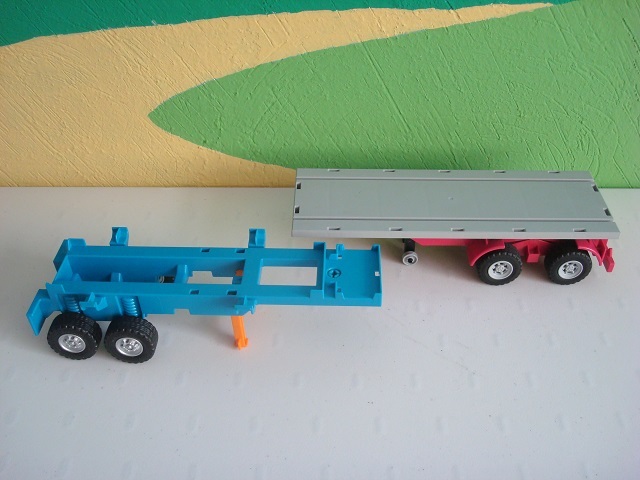 So, the old lowboy kingpin is loose in the new tractor unit fifth-wheel and the new lowboy kingpin does not fit into the old fifth-wheel hole.